The earliest Massachusetts records of this venerable native skipper go back to the 1820’s, when Thaddeus W. Harris found Hesperia tityrus, as he called it, in the Boston area. He had three specimens dated June 1821, likely found in Milton, and one labeled July 20, 1836, Cambridge (Harris Collection, MCZ; Index). Harris was thoroughly familiar with the species, writing in his 1841 report that “This large and beautiful insect makes its appearance, from the middle of June till after the beginning of July, upon sweet-scented flowers, which it visits during the middle of the day.” “The females lay their eggs, singly, on the leaves of the common locust-tree (Robinia pseudacacia), and on those of the viscid locust (Robinia viscosa), which is much cultivated here as an ornamental tree.” “The viscid locust-tree is sometimes almost completely stripped of its leaves by these insects, or presents only here and there the brown and withered remains of foliage, which has served as a temporary shelter to the caterpillars.” (Harris 1841:223-4). It is probable that like most skippers, Silver-spotted was not common in the pre-settlement era of extensive forest cover. Perhaps it was not even here prior to 1600, or was found only in the few open and disturbed areas, such as around Native American encampments, where some of its native host plants were found. But it undoubtedly became common as European settler agriculture expanded after 1600 (Table 1), and as locust trees were introduced from further south. At the end of the 19th century, Samuel Scudder found Silver-spotted Skipper to be “tolerably common, sometimes abundant” in southern New England, noting that it was often seen nectaring in flower gardens (1889:1403). Pioneering collector F. H. Sprague took many specimens in Belchertown and North Leverett in July 1878 (Sprague 1879; N. Leverett specimen in MCZ)). Sprague's specimens from Malden (7/22/1883; 5/30/1895, 5/17/1896), and Wollaston (6/4 and 6/18/1883) are in the Harvard MCZ today. Other early MCZ specimens are from Wellesley (1896, Denton mount), Waltham (5/30/1897, C. Bullard); Weston (1918, John B. Payne); Tyngsboro (6/22/1919, H. C. Fall); and Bristol R. I. (6/11/1918, H. L. Clark). 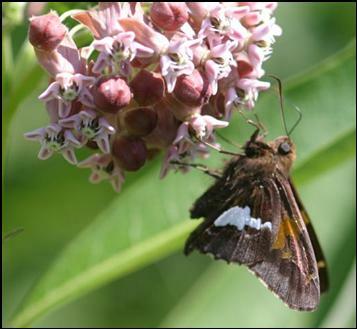 If Silver-spotted Skipper was in New England in the 1600's, it doubtless used only it’s indisputably native New England host plants, Apios americana or groundnut, and Amphicarpaea bracteata or hog-peanut. But by the early 1800's, as Harris tells us, it had also begun to use introduced locusts: mainly black locust (Robinia pseudoacacia) , but also clammy locust (R. viscosa), and bristly locust (R. hispida). South of New England, the skipper also uses honey locust (Gleditsia) and a variety of other pea family hosts. Sorrie and Somers (1999) list black, clammy and bristly locusts as ‘introduced’ to all Massachusetts counties. But they were probably brought in from the southern states and are likely native to the New World (Leighton 1976:18; Magee and Ahles 1999). Today, black locust has become an invasive weed, spreading rapidly along many of our roadsides and vacant lots. The Silver-spotted Skipper seems to have been using the locusts further south, and its increase in Massachusetts may well have coincided with the importation of the southern host plants. John Abbott first figured the butterfly in Georgia in the late 1700s, on the "wild locust" (probably R. pseudoacacia) (Calhoun, 2006a). Scudder, after noting the use of groundnut in our area, said that he was “inclined to think that Robinia hispida is its commonest food in New England” (1889:1403). Mello and Hansen think that the skipper may have arrived on Cape Cod along with locust trees: “The Silver-spotted Skipper is not native to Cape Cod, but arrived after black locust, the primary larval host plant, was introduced. Recently, both clammy and bristly locusts have also been planted on Cape Cod, and have either escaped from cultivation or expanded beyond initial plantings as dune or roadside stabilizers. Larvae will readily consume both species” (2004: 56). Indeed, at Wachusett Meadow Sanctuary in Princeton photographer Sam Jaffe found Silver-spotted Skipper caterpillars in all instars on all three host plants: hog peanut, groundnut, and locust (Jaffe, 2009; and 8-2-2010). Thus, Silver-spotted Skipper either quickly added locusts to its plant repertoire when those plants arrived in New England; or it arrived here along with the locusts, and then switched to the more native legumes. In either case, it proved adaptable in choice of food plant (Table 3). It can be found in most open habitats: edges, parks, gardens, roadsides, hedgerows. Not common in woodlands. Silver-spotted Skipper remains common today because its locust host plants are well-adapted (some would say too well-adapted) to disturbed areas (Table 2). The 1986-90 MAS Atlas termed it “common”, but a more detailed analysis using 2000-2007 MBC records shows that in terms of numbers seen it barely meets the lower threshold for "Common." It is not Abundant in the same sense as Cabbage Whites, Pearl Crescents, and the Sulphurs are (Table 5). It is similar in abundance to the American Lady and the Eastern Tailed-Blue. Chart 70 of MBC sightings per trip report shows a choppy year-to-year pattern, but there is no suggestion of a long-term trend either up or down. The important list-length analysis of MBC data 1992-2010 by G. Breed of Harvard Forest also showed no significant trend in the detectibility of this species (Breed et al. 2012). In 1999 unusually large numbers were reported from the Northern Worcester and Central Franklin NABA Counts (506 and 422, respectively), but there were also large numbers reported from other locations that year, and it was a banner year overall for many duskywings and large skippers. The year 2004 again saw especially large numbers from Northern Worcester NABA (404), and from Central Franklin NABA (115); both these counts periodically report triple-digit numbers of Silver-spotted Skippers. Silver-spotted Skipper has been found in over half of the 351 towns in the state between 1992 and 2013, and probably could be found in all Massachusetts towns. The 1986-90 MAS Atlas found it distributed throughout the state, with the single exception of Nantucket. BOM- MBC records confirm this distribution. There are still no records from Nantucket, nor were there any historically (Jones and Kimball 1943), but observers such as LoPresti predict that it may well be found there soon, since locust shrubs are "omnipresent" (LoPresti 2011). There are many reports from Martha’s Vineyard, and the local checklist ranks Silver-spotted Skipper as “Common” (Pelikan, 2002). It was also widespread and common in the 1930's and 1940's, with larvae often abundant on the naturalized locust trees along roadsides (Jones and Kimball 1943). As for other islands, Silver-spotted Skipper is at home on Nahant (many reports, max 4 7/21/2003, D. Saffarewich), and at World’s End (Mello 2003), but has not yet been seen on the rest of the Boston Harbor Islands. All the NABA Counts have reported this species. In addition to the occasionally large numbers from the Northern Worcester and Central Franklin counts mentioned above, high numbers are also often reported from the Blackstone Valley Count (max 95 on 7/12/2003), the Concord Count (max 125 7/12/2003), Martha’s Vineyard Count (max 97 on 7/14/2001), Foxboro Count (max 80 on 7/11/1993), Truro Count (max 45 in 7/10/2004), and Northern Essex Count (max 154 on 7/3/2010). These count circles encompass some drier upland habitat which Silver-spotted Skipper finds favorable. They contrast with the Berkshire and Bristol Counts, which usually report much lower numbers of this species. Worcester Broad Meadow Brook WS (16, 7/3/2007, B. Walker and E. Barry); Williamstown Mountain Meadow (17 on 7/14/2012, B. Zaremba and P. Weatherbee); Williamsburg Graves Farm (20 on 7/11/2010, B. Benner et al. ); West Boylston Gate 35 (34 on 7/24/2005, Wendy Miller et al. ); West Newbury Cherry Hill Res. (13 on 7/5/2009, E. Nielsen); Wellfleet Wellfleet Bay WS (9 on 7/3/2013, M. Faherty); Topsfield Ipswich River WS (10 on 7/6/2008, S. Stichter et al. ); Sterling Wachusett Reservoir (70 on 7/26/2003, T. and C. Dodd); Sheffield Bartholomew's Cobble (13 on 7/8/2012, B. Benner et al. ); Royalston Tully Dam (15 on 6/7/2009, C. Kamp); Princeton Wachusett Meadow WS (10 on 7/14/2013, W. Howes); Paxton Moore SP (10 on 7/6/2010, E. Barry); Northampton community gardens (15 on 8/17/2013, S. Moore et al. ; Newbury Old Town Hill (102 on 7/3/2010, E. Nielsen); New Bedford Plainville Road (13 on 7/26/2009, M. Mello); Monson Norcross WS (25 on 7/14/2011, E. Barry et al. ; Longmeadow Fannie Stebbins WS (8 on 8/7/2010, M. Arey); Leicester var. areas (106 on 7/21/2013, D. Price et al. ; Gloucester (18 on 7/25/1998, D. Savich and C. Tibbits); Charlton power line, 14 on 7/19/2011, B. Bowker; Carver Myles Standish SF, 10 on 6/27/2010, M. Arey. Silver-spotted Skipper has a relatively long flight time here, from mid-May to mid-October, according to MBC records (http://www.naba.org/chapters/nabambc/flight-dates-chart.asp). It has been thought to be single-brooded here, but probably also has a partial second brood. Earliest sightings: In the 23 years of BOM-MBC data (1991-2013), the seven earliest "first sightings" reported are 4/21/2012 [extremely early; 3-4 weeks earlier than any other known date; next earliest that year 5/17] Winchester Middlesex Fells, M. Arey; 5/9/2010 Newbury, M. Arey; 5/14/1998, Sunderland, D. Case, 5/18/2004 Harvard Oxbow NWR, T. Murray, and 5/20 in 1995, 2001, and 2009. The influence of the very warm springs in 2012 and 2010 is evident here. In another 13 of the 23 years under review the first sighting was in the last week of May (between 5/21 and 5/31). One hundred years ago, Scudder reports that this butterfly usually made it’s first appearance “during the first week in June, but not infrequently as early as the 22nd or 24th of May.” This early date is from Milford, N. H. (Scudder 1889: 1409). There are seven years in current records which are earlier than Scudder's earliest date, and another 13 in which the first sighting was before June 1. The most frequent week of first sighting is now clearly earlier than “the first week in June.” There may have been some flight advancement in this species over the last century. Latest sightings. In 23 years of BOM-MBC records (1991-2013), the six latest "last sightings" are 10/20/2013, Easthampton yard, Bruce King; 10/12/2000 Northampton Florence, T. Gagnon; 10/10/2006 Northampton comm. gdns., B. Spencer; and 10/6 in 2007, 2011, and 2012. Scudder wrote that Silver-spotted Skipper in southern New England continued to fly “until the end of July or the first week of August” (1899: 1409). As is clear from BOM-MBC data, the flight period has obviously lengthened much beyond August. Silver-spotted Skipper has been seen into October in 11 out of 23 years (1999, 2001, 2002, 2003, 2005, and the six listed above). In years prior to 1996, the latest MBC and Atlas sightings were all in August. From 1996 on, all last sightings are at least in September, and many are in October. Broods: These observations of fresh individuals still flying in September and early October, and a small bulge of sightings the third week in September in the MBC flight chart, now strongly suggest at least a partial second brood. Scudder had supposed that this happened occasionally at the latitude of Boston. He knew, for example, that F. H. Sprague had taken some good specimens around Boston "at the end of July and during the first three weeks of August" (1889: 1410). Cassie, writing the 1986-90 MAS Atlas, also mentioned the probability of a partial second brood. BOM-MBC data now provide supporting evidence. Given this species’ widespread host plant, use of disturbed habitat, and broad statewide range (indeed nearly continent-wide), this species is likely to remain common in Massachusetts. It may increase or at least remain stable here in the coming years. There is no reason to expect that warming summer temperatures (climate change) would adversely affect it in this state.